In one of his more ridiculous commentaries, one of many delivered over the years, ESPN First Take host Stephen A. Smith seemed to suggest current Philadelphia Eagles head coach and former University of Oregon head coach Chip Kelly is a racist, or has racist motives in how he structures the team. 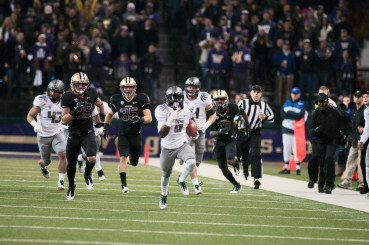 De’Anthony Thomas was one of the most celebrated and exciting players recruited under Chip Kelly. Wow! Nothing like using one player, Riley Cooper in this case, as the foundation for an entire argument. Now I am supposed to believe that Kelly, since moving to the NFL, a league where over two-thirds of its players are African-American, is building a team based on racism? As many people in the media have been quick to note in the aftermath of Stephen A’s comments, Kelly has released white players in addition to signing plenty of African-American players. Chip Kelly chose Darron Thomas to be his starting quarterback over Nate Costa, a white player. Oregon fans, of course, do not even need to look beyond Kelly’s tenure at Oregon to see through the absurdity of Smith’s comments. He chose Darron Thomas as the starting quarterback over Nate Costa, as just one high-profile example. Chip Kelly certainly has enough credentials to refute, if he so chooses, this unwarranted commentary from Smith. As all of us Duck fans know very well, Kelly has no problem articulating his thought process or speaking his mind. If Kelly indeed does address Smith’s remarks, his response will not be in typical “coach speak” fashion. What is most bothersome about this type of commentary, given the way news travels in today’s instantaneous world, is that someone like Smith, who has a lofty soapbox (ESPN) from which to lob his grenades, can simply suggest possible racism without actual proof of it. He can easily string together a bunch of names and connect them with dots of his own choosing (while ignoring other dots) and then launch his attack. Chip Kelly, and the American viewership, deserve better.